Also Known As: "Nils", "Nils Nicholas Mattson Utter", "Nicholas Utter"
Nicholas Utter, Peter Utter, Jabez Utter Jr.
Notes for NICHOLAS MATTSON UTTER: Nils Matson Utter soldier and member of the tenth expedition to Delaware. Found on Parkhouse records from May and June 1655. It shows that Nils was a member of the Vestmanlands Regiment from 1653 - 1655, serving as a light Auxiliary troop that would have such functions as Pioneer, Flanker, Forager, Skirmisher, Baggage Or Prisoner guard. 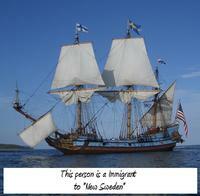 Lt Skute hired troops in Vasteras in 1653 then sent them on to Stockholm to wait shipment on the Orn.